How tensed are you on the eve of the release of "Baba"? I am cool and relaxed, after the hectic four-month shoot and post-production work. The film as you will see, has shaped out well and all of us are extremely happy about the product. How confident are you about the commercial success of "Baba"? After seeing the first copy of the film, Rajnikanth himself was very pleased and we are sure that it will be a roaring success. There is no doubt that it is also going to be a landmark film. The pre-release hype on "Baba" is driving Rajnikanth fans crazy. Why? Rajni's last release was in April 1999. Since then for more than three years and four months everybody including his fans worldwide is eagerly waiting for a new release from him. The media too has been giving a lot of prominence to the release of "Baba". What is it that makes Rajnikanth a sort of demi-God? I think he has a larger than life image not only in his films but in real life too. According to my experience, he is a down-to-earth, humble and above all a good human being. Maybe that is why everybody loves him. What is "Baba" all about? Sorry, I can't tell you the story. Wait for a couple of days more and see the film. I can assure that you will be entertained. How did the story of "Baba" evolve? 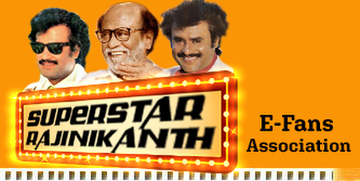 The story and screenplay was by Rajnikanth himself, as it appears on the credit title in the film. When he narrated the story to me, I was amazed by his vision and clarity of thought. He is a great improviser who can make the film better even while shooting. 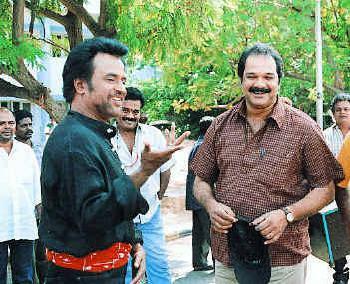 Every morning we used to work on the script and nobody understands the mind of a common man as Rajni does. He knows exactly where to place the mass-oriented dialogues and how it works. How would you describe the much talked about `Rajni Style'? "Baba" is my fourth film with Rajni and I can say that there is no hero in the World with such mass appeal and charisma. People come to the theatre to listen to him and no other actor has the star power that he has. Whatever he does on screen, there is a unique `style' about it. He knows what ignites the crowd and his trademark punch lines and dialogues create a halo around him. The kids of the new generation recite all the dialogues from "Baasha" even today! There have been many clones of "Baasha" like the recent Chiranjeevi starrer "Indra". Please comment. I do not like to blow my own trumpet but "Baasha" was a classic within the commercial format. This film, due to its mass hero subject has inspired all the heroes in other languages. But trust me that nobody has ever been so successful as Rajnikanth. He understands the pulse of the common man. Is "Baba" also a mass hero subject? The film has all the essential ingredients like a basic story line, hard-hitting punch lines, action scenes, songs and a bit of politics and even spiritualism. Gopu Babu's crisp dialogues, Chottu Naidu's camera and Vijayan's racy editing are the other highlights of the film. You are the first director who introduced current day politics into Rajni potboilers in films like "Annamalai" and "Baasha". Please comment. (Laughs) Yes, I did introduce a pinch of politics into Rajni films because he is a mass hero and now people expect him to make a sweeping statement about the current state of affairs. But it has to be sugar coated and packaged well with all essential ingredients to make it successful at the box-office. In "Baba" too there is politics, but no political party or leader has been targeted or shown in a bad light. The censors have given the film a clean `U' certificate and even ladies and kids will enjoy the film. But the music has not been appreciated? Who said so? The audio is selling like hot cakes and will do better once the film is released. Please note that A.R.Rahman's music takes time to grow on you. Is the film going to be a launch pad for Rajnikanth's political career? You see the film and decide for yourself. All I can say is that  "Known is a drop. Unknown is an ocean"!